PeopleSoft has thousands of views! If you want to know just how many there are, try this query to give you the distinct views (RECTYPE = 1) from the PeopleTools record definition table, PSRECDEFN. If you want to know who created these views, use the following query. 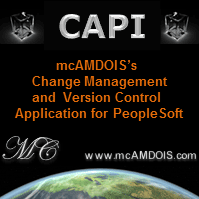 Note that a LASTUPDOPRID of PPLSOFT generally means that the view was delivered by PeopleSoft. Replace the % with the fields you want to match on. If you have less than three fields, leave the other matches as %. 3 characters are going to go to your customisation prefix (e.g. PB_ in my example) unless you are fortunate enough to have a 1 character prefix (or unfortunate enough to have more!). That leaves you with 9 characters, one of which is probably going to be an underscore (_) to separate words. So think about that when you go to name your view. Include as many of the fields from the underlying tables as possible. So long as it make sense to do so based on the SQL in the view. The more fields, the more likely that your view will provide the information someone else wants. Don't include more business rules/logic in the view than what is absolutely necessary. For example, if you have a view that returns current names, then don't just include primary name types - return all name types and then filter the name types you need in your own code. Of course don't make it too hard on yourself either - there's no point having a view that you have to add a number of conditions to just for the sake of reuse. Remember reuse is going to be a comprimise. Give your views a decent name & description. Its hard to find views for reuse, don't make it any harder by using an obscure name and not providing a relevant description.